A home cinema installation is designed to offer life-like audio and video accuracy, but it will never look or sound that way if you're watching on a TV - even a large one - because what's really missing is life-like scale. It's the dimension that brings all your films, games and channels alive; without it, home entertainment can deliver only a fraction of its potential. At Empower we design and install systems in the Dorset area. 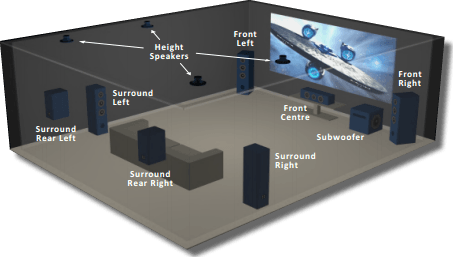 What Is A Home Cinema Installation ? Think of your new home cinema as an enduring high quality audio and video installation, not the lightweight speakers you'll find bundled with a TV screen. Using proven pro-cinema technologies home cinema transports the excitement of the big screen experience to your home. More than that, expert installers will work with you to customise the system according to your taste, budget and environment. In this way the performance of home cinema is more powerfully focused than any commercial installation, as unique and personal as your home itself. The definitive home cinema experience involves a big specialised projection screen and projector, together with a multi-channel surround system, which supplies an enveloping sound stage from at least five speakers (with sub woofer support) positioned around the room. Your custom installer may also recommend acoustic treatments to heighten and contain the surround effect, as well as the comfort of home seating to complete the magical chemistry of home cinema immersion. The project can be as wide as your ambition, but the versatility of custom installation means that you can enjoy immersive room-filling pictures and sound without filling the room with gear. In living areas such as media room extensions and sitting rooms, a motorised cinema screen and projector can be specified together with near -invisible in-wall/ceiling speakers. Even in dedicated cinema rooms, the most discreet, decor-friendly installation is a luxury custom option. Billed as the next big leap in technology beyond 4K, HDR gives the image more contrast between its lightest and darkest areas, so you see more life-like detail and texture. The HDR pictures on smartphones will give you some idea of the effect, but this is produced from combing multiple images rather than cinema HDR, which is generated using enhanced camera technology. Just like the sound systems built into commercial cinemas, a home cinema audio system comprises three speakers positioned around or behind the screen and carrying left, centre and right channel sound according to the original multi-channel film mix. These are joined by two surround speakers providing the surround sound for an enveloping sound effect, and a subwoofer which handles the bass or Low Frequency Effects (LFE) channel. This is the 5.1 configuration (five full range channels and a single bass channel) of sound formats such as Dolby Digital and DTS. Later versions of these formats - Dolby TrueHD, DTS-HD Master Audio – split the surround sound into four separate channels, adding side speakers in the process to create a 7.1 configuration. Dolby TrueHD and DTS-HD Master Audio are also designed to carry Dolby Atmos and DTS:X, the very latest surround sound formats, which add overhead sound for the most realistic surround effect. These new formats are created using an “objectbased” technique which allows the studio engineer to place individual effects anywhere in the sound field. Dolby Atmos requires at least one pair of height speakers (either in-ceiling, or upward-firing Atmos-enabled speakers) for a 7.1.2 channel set-up, but the format can be extended to include, for instance, a further pair of height speakers for a 7.1.4 channel configuration. DTS:X on the other hand works with a regular surround sound speaker system and has no specific demand for dedicated height channels. involving in-room front,side, surround and in-ceiling height speakers. Glass room boundaries? No problem: angled drivers in the versatile Sonance SUR1S in-ceiling speaker will bounce surround sound towards the listener. In-wall speakers hidden behind an acoustically transparent screen for the ultimate in discreet cinema design. The seating element of every system is where the sensation of home cinema really begins! Most ranges have a modular format which allows your installer to specify a straight, curved or tiered arrangement with the style and finish that meets your needs exactly. YAM-RX-A3060Yamaha 11.2ch, Dolby Atmos®, DTS:X HDMI®, 4K/60p, 4:4:4, HDCP2.2, HDR and BT.